Daimler-Benz was the name of the company that owned Mercedes-Benz in the 1930s. 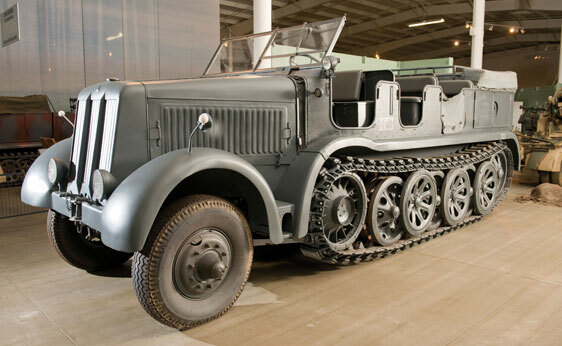 Instead of badging their Sd.Kfz.8s as “Mercedes-Benz,” they went ahead and just called them “Daimler-Benz”es – as were most of their heavy machinery during the war. The front is adorned with the three-pointed Mercedes-Benz star, but lacks the ring around it. These were in production from 1937 until 1945 and used a Maybach 8.5-liter V12 making 185 horsepower, although this particular truck is engine-less. It has a 12-ton payload capacity – in other words, it’s a monster. About 4,000 were built in total by various manufacturers making this one of the most desirable half-tracks you can get. More here. This entry was posted in Uncategorized and tagged 1945, auctions, auctions america, classic trucks, daimler-benz, db10, military, military vehicles, sd.kfz. 8, trucks by classiccarweekly. Bookmark the permalink.